Most people don't give a lot of thought to the idea of taking a shower while standing up, as bathroom space constraints and a little thing called gravity certainly call for it. However, a German company named Dornbracht looks to revolutionize our conception of the modern shower stall with the world's first horizontal shower designed for home use. According to the New York Daily News, the $35,000 device is now on display at the Jacob Javits Center in New York City as a exhibition during the International Contemporary Furniture Fair, and it has already drawn rave reviews from attendees. "This system allows an individual to personalize the shower experience and set the controls for whims, moods and needs," Dornbracht CEO Andreas Dornbracht told the news source. The cutting-edge shower panel system is designed to have the user lying down on a stone slab, and six overhead water bars can be controlled independently to give each user a unique experience. Gizmag.com reports that the system will come with a minimalist control panel that is placed in the wall next to the device that will allow the user to control water temperature, intensity and quantity settings, as well as controlling the choregraphy of the showerheads themselves. 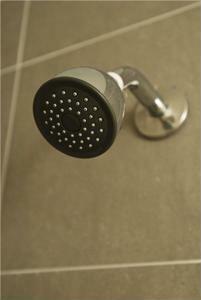 The sleek design will certainly give any bathroom an aesthetic boost, but is it really superior to a vertical shower? While the device does give users the ability to recline slightly, they are still seated on a slab of stone which can't be the most comfortable thing in the world. The device puts an end to slips in the shower, but it's certainly not meant for those looking to conserve water or create a sustainable bathroom. Additionally, the horizontal shower will require a very large bathroom with adequate drainage, so it's certainly not meant for budget-savvy consumers or those with significant space constraints. Time will tell whether or not the horizontal shower will catch on in American households, but the device is certainly piquing the interest of interior designers at the International Contemporary Furniture Fair. While the designers at Dornbracht feel that they have reinvented the wheel and found the perfect balance for their horizontal shower, they still have a few major kinks to work out and it looks like we'll all have to remain vertical for a little while longer.